Jerry Brown Takes Oath 'Without any Mental Reservation ... Really!' : The Two-Way Times are tough in California, but it doesn't hurt to have a chuckle. And Gov. 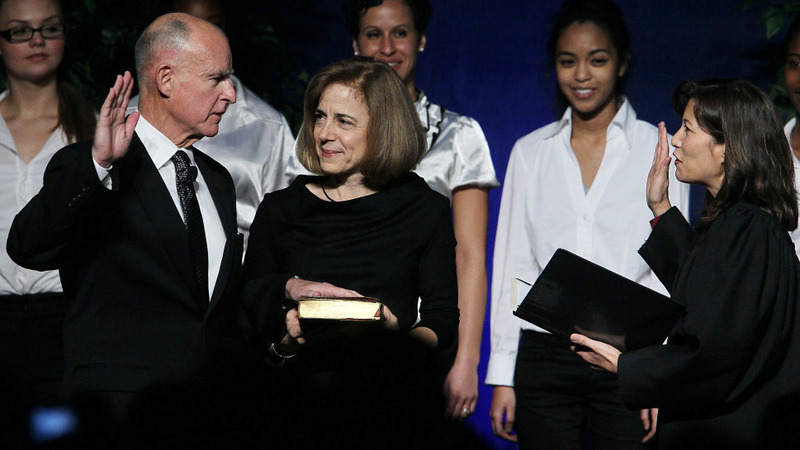 Jerry Brown had a laugh at his own expense during his inauguration today. Jerry Brown (left) is sworn in as the 39th governor of California by California Chief Justice Tani CAntil-Sakauye (right) as Brown's wife, Anne Gust-Brown, looks on. Times are tough in California, but it doesn't hurt to have a chuckle. Brown: "I take this obligation freely." California Supreme Court Justice Tani Cantil-Sakauye: "Without any mental reservation." Brown: "Without any mental reservation." Brown: "Really! No mental reservation." Earlier today, NPR's Ina Jaffe reported that there's been "no Hollywood ending" to Republican Gov. Arnold Schwarzenegger's term.